The Bouchon collection is a set of recipe books by one of my idols; Thomas Keller of The French Laundry. Bouchon is the three Michelin starred chef’s bistro in Yountville, California that serves French classics like beef bourguignon, salt cod brandade, and quiche. There is a chapter on the quiche where Keller talks about the lost art of making great quiche; something which seems to have gone out of fashion, or forgotten about. 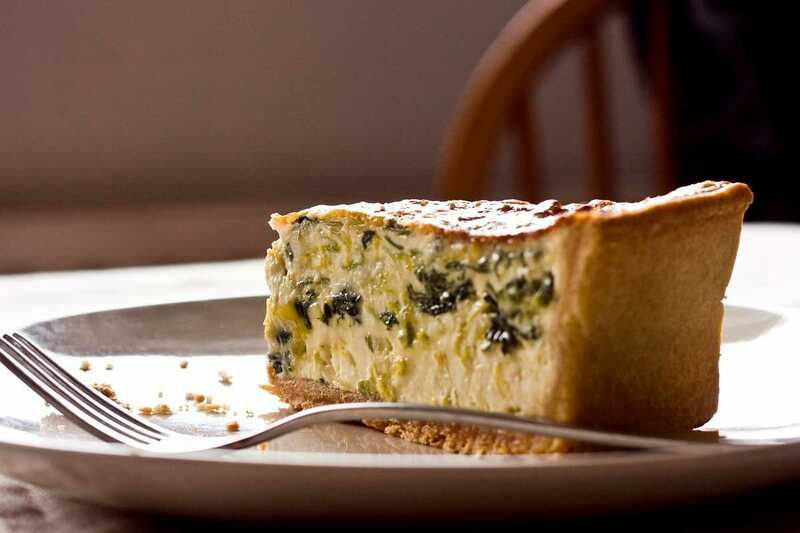 A proper quiche will be two inches deep, filled to the very brim with a barely set, perfectly light custard. The shortcrust pastry should be rich and crisp, and specifically 4-5mm thick, so that it remains crisp and doesn’t become soggy after cooking. I had a couple of attempts at this quiche before getting a satisfactory result, and I was pleased with my third try. I actually bought a 9″ quiche ring especially for the task as none of the pastry rings in my house were quite the right size. One of the brilliant things about this recipe is the lightness of the custard; Keller blitzes the custard mix in a blender before pouring into the pastry shell, aerating the mix and resulting in a delicate light filling. This recipe is more or less the same as that found in Bouchon, but I’ve added spinach to the filling and converted the ingredients from pounds and ounces to kilograms. To make the pastry: cut the butter into small dice, and rub into the flour and salt with fingertips until it resembles fine breadcrumbs. Mix the water in and knead very briefly to incorporate. Don’t overwork. Wrap, and refrigerate for at least an hour, preferably overnight. Roll the pastry out until you have a circle about 35cm in diameter and 3-4 mm thick. Take a 9 x 2 inch plain ring and place on a tray lined with parchment paper. Carefully line the ring with the pastry, being careful to press evenly into the sides and corners. Leave about an inch of pastry hanging over the edge. This will help prevent it from shrinking inwards when baking. Reserve trimmings for patching any cracks in the pastry later. Heat the oven to 190 C. Place the pastry shell in the fridge or freezer for at least 20 minutes before cooking. Now line the pastry with a round of parchment paper and fill with dried beans or rice, pressing gently to fill the shell completely. Blind-bake the pastry for 35 to 45 minutes, until the outside of the pastry is golden and crisp but the inside still light. Remove the beans and parchment paper and return the shell to the oven for a further 20-30 minutes, until golden and crisp inside and out. Patch any cracks with the trimmings, returning to the oven for a further 5 minutes. Heat the oven to 165 C, then prepare the filling: take three large leeks and slice thinly, discarding the dark green part or reserving for another recipe. Cook in a large pot of salted boiling water for 3-4 minutes, until tender. Drain on kitchen paper. Wilt the spinach by searing in a hot pan with a glug of olive oil, adding a pinch of salt. Mix with the cooked leeks. For the batter, heat the milk, cream and salt in a pan until a skin just begins to form on the surface. Place 3 eggs, half the cream mixture, 3 gratings of nutmeg and half the white pepper in a blender and blitz for about 30 seconds until foamy and light. Spread out half the leek mixture and half the roquefort in the bottom of the quiche shell, and pour over enough batter to just cover. Repeat with the remaining filling and batter mix. Fill the quiche to the very brim. Reserve any left over filling. Carefully place in the oven being careful not to spill any of the mix. Cook for about 1 ½ hours, until the quiche is nicely brown and the custard just set when jiggled. After about 20 minutes the custard will have sunk slightly in the middle as some of the air escapes the mix; simply top up with the leftover batter and return to the oven. Refrigerate for at least a day, or up to 3 days, until completely set. Slice into portions and reheat gently in the oven. Alternatively, it is just as excellent eaten cold.